West Cornwall is on the very tip of south west England like a foot jutting out into the Atlantic Ocean. Land’s End situated on the very end of this beautiful peninsula is home to the first and last house and is a must place to visit. This extreme part of Cornwall has an air of wild ruggedness and its narrowness make it a quite unique place. There is nowhere else on mainland Britain where you can be only a few miles from both north and south coasts and if you stand on Trencrom Hill or Chapel Carn Brea you can see them both. There are many towns, fishing villages and harbours, coves and sandy beaches all with their own beauty and character. Penzance is the areas main historic market town, Falmouth is one of the biggest towns and Newquay is one of the most popular resorts. The peninsular with its many places of historic interest there is always something for everyone so you will never be disappointed with this charming part of England. Porthcurno is a small village in the parish of St. Levan on the south coast of Cornwall. The village located in “The Valley” consists of houses, apartments, a pub, a seasonal cafe/restaurant and a large beautiful white sand beach. The fine soft white sand is washed by a sea that turns turquoise in the sun. The steep sided slopes of the valley and the rocky outcrops, that provide shelter, add to its beauty and the South West Coast Path along the cliffs provides fantastic views. In the valley there are remains of man-made stone tracks for horse-drawn vehicles one of which can be seen from the car park down to the beach this indicates evidence of early commercial port activity. The cliffs and coast line around Porthcurno are officially designated Areas of Outstanding Natural Beauty and most of the area is owned, preserved and maintained by the National Trust. To the west side of the beach it is the Logan Rock headland that shelters the bay. The prevailing wind and the winters are unusually mild because of the influence of the warm Gulf Stream sea current crossing the Atlantic Ocean from warmer seas around the Gulf of Mexico. The south Cornish Coast has some of the highest air temperatures and sub-zero temperatures and frost are uncommon thus making the area popular with tourists and holiday makers many from abroad. Situated in the cliff face above beach to the west is the open-air Minack Theatre built in the 1920s by theatrical visionary Rowena Cade and her faithful gardener. The theatre is open for plays produced by companies from all over the UK and visiting companies from the USA from June to September. The Rowena Cade exhibition centre, coffee shop and theatre are open, except during performances, throughout the rest of the year for visitors wishing only to view the sight. There is an entrance fee and a large car park. Porthgwarra is a small coastal village also in the parish of St. Levan houses public toilets, a pay telephone, a shop and cafe. The South West Coast Path passes through the village and walkers can take a break on the seat or rocks and admire the wonderful views. The tiny cove and slipway is privately owned by Lord St Levan of St. Michael’s Mount and the public are permitted to respect and enjoy them. At the foot of the cove’s slipway is a tunnel dug by miners from St Just to give farmers horse and cart access to the beach to collect seaweed to use as fertiliser. A second tunnel was the fishermen’s access to the tidal hulleys built in the rocks which had wooden floors and topcovers with trapdoors and were used to store shellfish before being taken to market. The rope laid down the beach is used to steady boats while landing. Rosamunde Pilcher (nee Scott) was born in Lelant, Cornwall in 1924. She is an author who has written romance novels and mainstream women’s fiction since 1949 and retired from writing in 2000. Two years later she was created an Officer of the Order of the British Empire (OBE). In her early career she was also published under the pen name Jane Fraser. She married Graham Hope Pilcher and had four children. Her son Robin Pilcher is also a writer. Her books are especially popular in Germany and the national TV station ZDF (Zweites Deutsches Fernsehen) has produced more than a hundred of her stories for TV starting with “Day of the Storm. 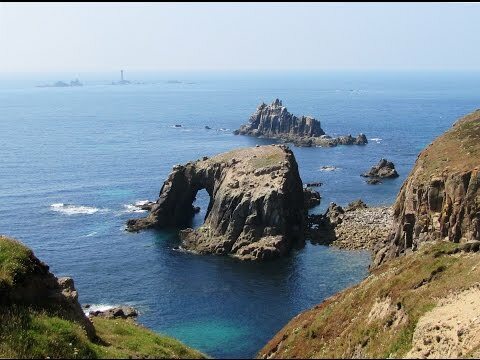 Land’s End is a headland at the most westerly point of mainland Cornwall and England. It is situated on the Penwith peninsula and often associated with distance. The famous landmark sign at Land’s End, where you can have your picture taken under it, points to New York 3147 miles, to John O’Groats in Scotland 874 miles and the Isles of Scilly 28 miles . The distance between Land’s End and John O’Groats is 838 miles by road and often used to define races, walks or charitable events in the UK. The headland has been designated as an important Plant Area by the organisation Plantlife for rare species of flora. Land’s End is a fabulous place to visit with something for everyone, of all ages, such as Greeb Farm and the Pottery, Arts and Craft Centre. The Visitors Centre, the West Country Shopping Village, cafes, eating places and attractions are open daily from 10am and last admission into the attractions is 4pm. Every Tuesday and Thursday from 26th July – 30th August all attractions, shops and restaurants are open late into the evening with entertainment from 7pm and fireworks at dusk. The coastal paths and landmark are permanently open. The car park is the only thing you have to pay for which is £5 all day. There are many paths above the cliffs whether for a short or long walks and there’s plenty of space just to sit and relax. The scenery is magnificent and just over a mile out to sea there are the rocky islets on which the famous Longships Lighthouse stands, first lit in 1873. Bring your binoculars because Land’s End is fantastic for birdwatchers you may see Gannets, Fulmars, Kittiwakes, shags, Razorbills and even the once extinct Cornish Clough. Not only are there many seabirds flying about but you may catch sight of the basking sharks, grey seals and dolphins that swim in the waters below the cliffs. We park in Porthcurno car park and walk towards the beach. At the top of the beach we turn right at the National Trust stone and head uphill. Just past an old beach cafe we turn right going steeply uphill. At the top we turn right at the Minack Theatre sign and then left into the theatre car park. We take a quick look round the theatre and garden then head across the car park to pick up the South West Coast Path. We now follow the coast path uphill and downhill passing through the small village of Porthgwarra all the way to Land’s End. On the headland above Portgwarra near the lookout station we were lucky enough to see a German TV crew filming. On arriving at Land’s End we walk through Greeb Farm, Pottery and Arts and Craft Centre then through the street of shops to the Land’s End sign and to view the First and Last House. We then head through the car park and the entrance and walk up the road to the brow of the hill. We turn right at the sign post for Porthcurno 3 miles and follow the road into Trevescan. Just past the Apple Tree Cafe and Art Studios we turn right in front of the houses and over the stile in the left hand corner next to a tree into a field. We cross the field and go over the stile and turn left to the farm. We go over a stile at the side of the building and turn right onto the track and follow the tarmac track round to the left with the buildings our right. We head forwards and the tarmac track becomes a grass path into a field. We head forwards for a short way and bear left through the field and straight over the next field heading towards the buildings of Higher Bosistow in the distance. After going through a gate we walk between two hedges for a short way then turn left downhill at the sign post to go over a footbridge at the bottom then uphill to a gate. We go through the gate and turn right towards the buildings. We go over a stile and turn right onto the track and after passing the house on our left and through a gate we turn left at the red arrow sign. Walk forward and follow the path round to the left between the building and keep heading forwards on the track between the hedges. At the road we turn left and then right onto a track sign posted Highlands. When we reach the buildings in front of us we turn right then at the end of the farm we turn left to go through a gate. We turn slightly right to go over the stile. We cross the next field to go between two posts then head to the right hand side of the next field to go over another stile which is quite well hidden. We head straight over the field towards the buildings one with a white end. We go through the left hand gate still heading towards the buildings. We go through a small iron gate and head forwards through the buildings. At the end of the buildings we turn left down the road making our way back to the car park. This is a moderate walk on good paths and tracks with some steep inclines and declines. There are some grass fields with stiles and gates and also some minor road. Elevation: Approx lowest point 3.9m (12.8ft) approx highest point 89.7m (294.3ft). Approx 9 miles allow 3½ – 4 hours using OS Explorer map 102, Land’s End Penzance and St Ives. Start Point: Porthcurno Car Park. Pay and Display £5.70 for all day. Porthcurno, on the south coast of West Cornwall. From Penzance take the A30 towards Land’s End. Take a left turn onto the B3283 through St Buryan and at Treen bear right. At Trethewey take a left turn and follow the road to Porthcurno and the pay and display car park is on the left. There are public toilets at Porthcurno, Porthgwarra and Land’s End. For refreshments in Porthcurno there is a pub the Cable Station Inn and a seasonal cafe. At Land’s End there is the Land’s End Hotel and shopping centre. There are also public toilets, a seasonal cafe and a pub, the Logan Rock, in nearby Treen. Help, I’ve been informed and I can’t become igtonanr.